Way back in October I was doing a music inspired lesson with 4th-6th grade. 6th Graders spend I think a whole 9-weeks studying astronomy and one of my favorite CD's is a performance of Gustav Holst's The Planets. 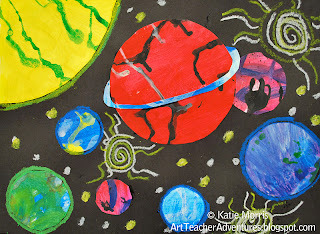 So my music-science-art fusion Planets lesson was born. In the first class, I gave a super quick introduction to Abstract Expressionism, focusing mainly on Jackson Pollock, then went further back into Art History to introduce Wassily Kandinsky. I talked about how Kandinsky is credited with making the first purely abstract paintings and was really influenced by music. 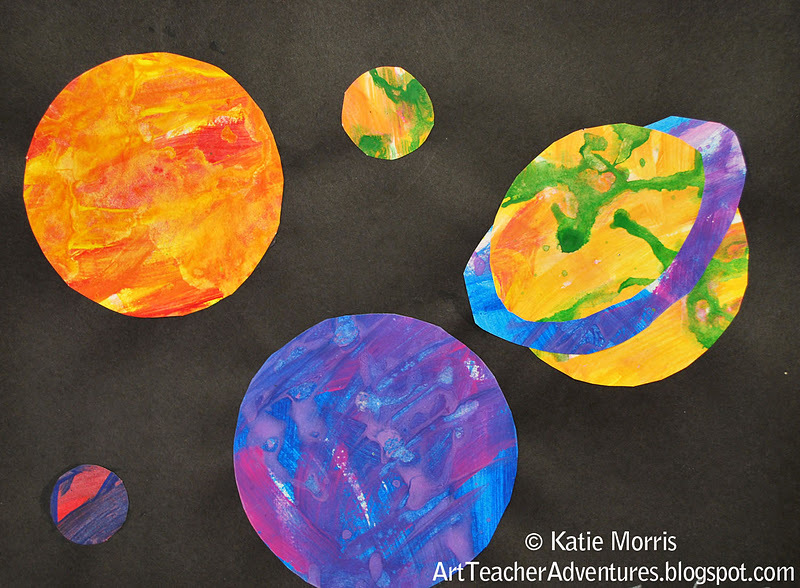 We had the same rhythm/harmony discussion as in my 4th grade Jazz Painting classes then I jumped right into the task for the day: create 4 abstract expressionistic paintings inspired by 4 of Holst's planets. The students were each given a piece of 12x18 inch white paper which they folded "hamburger" AND "hotdog" style to create 4 sections. 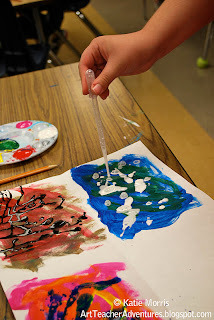 I had primary and white colored tempera paint at each table and cups of diluted tempera paint available to the students. They had about 2-3 minutes to paint for each song. They painted with their brush trying to fill in the whole rectangle then used paint droppers to drip and splatter paint (ties in Pollock) on top. I believe the 4 planets we listened to were Mars bringer of war, Venus bringer of peace, Jupiter bringer of jollity, and Uranus the magician. I said in the title of this post that this was the best art class ever. I really mean that. I have never, EVER, had 6th grade students working so quietly. And they were LOVING it! Even with only a few minutes to paint each section, every student finished. I had to take a video to kind of prove it to myself because I could hardly believe how smoothly it was going. If you watch the video, make sure you have the volume turned up so you can really get a feel for it. 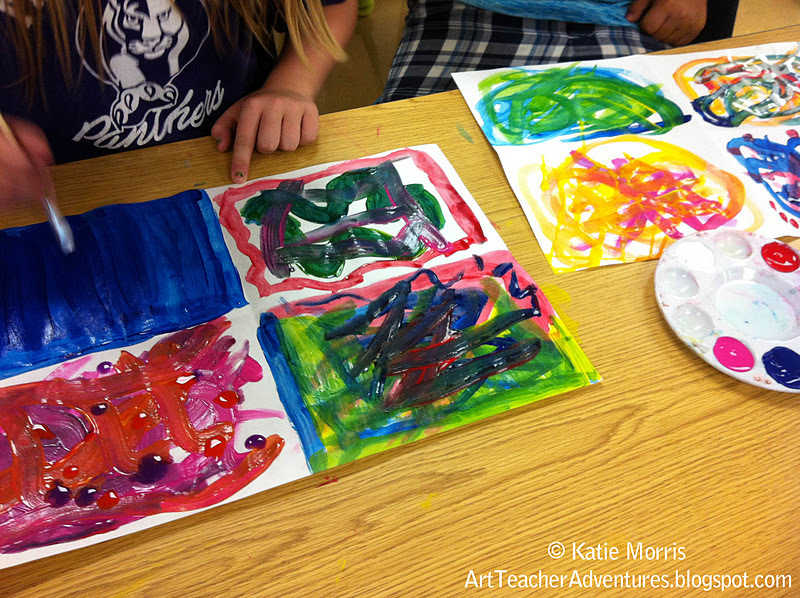 After the first class I asked the students to let the extra dripped paint run off their papers into the trash can. 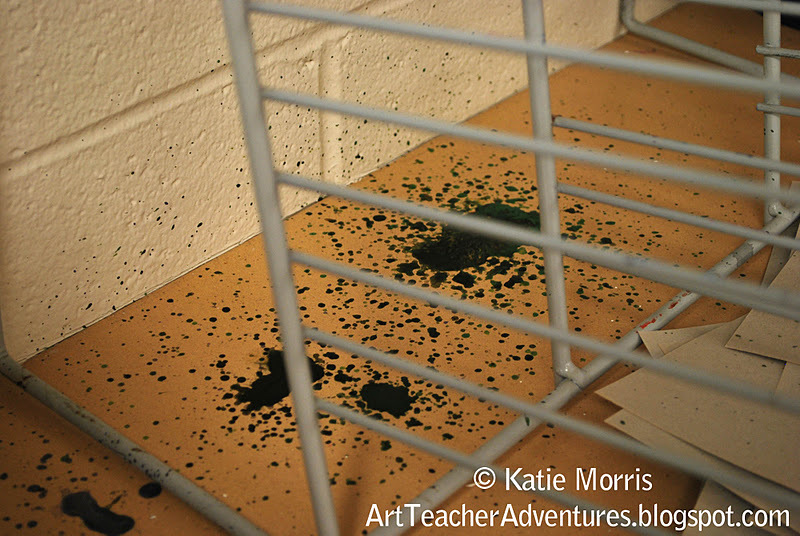 I recommend that, otherwise your floor or counter will look like this under your drying rack. I don't think I told the students what we would be doing with the paintings until we were done, mostly because I wanted them to fill the whole space. In the second class, the painted papers were cut apart and the students used their paintings to create a collage. 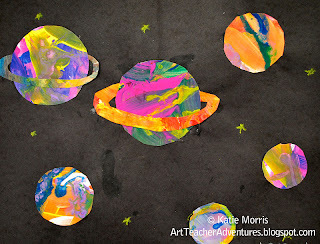 I didn't really teach them anything about astronomy, but we did brainstorm some things they could include in their artwork- planets, rings, moons, stars, asteroid, etc. 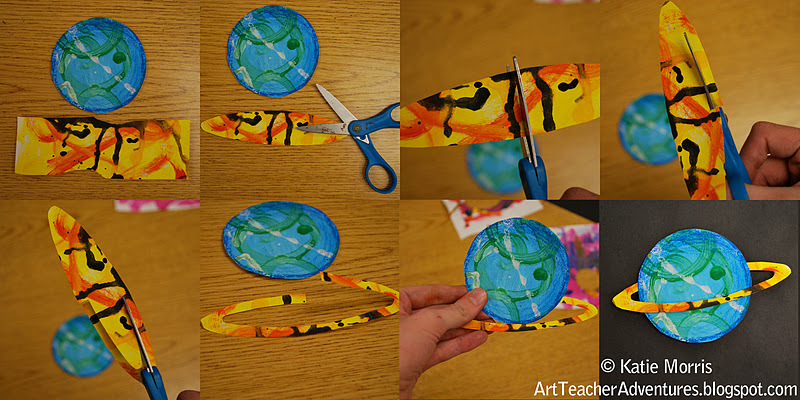 I gave the students compasses to use if they wanted but also demonstrated cutting a circle freehand. TIP- Save the scraps of painted paper for students to trade for adding details or for students who missed the painting session. I know we should let students figure things out for themselves but I did show them how to make a ring for a planet. The overlapping and cutting out negative space was really throwing most of them. 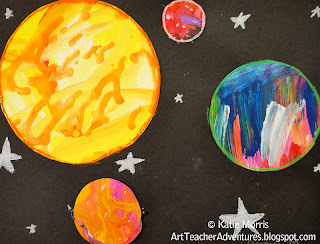 Students who had enough time used oil pastels to add details. 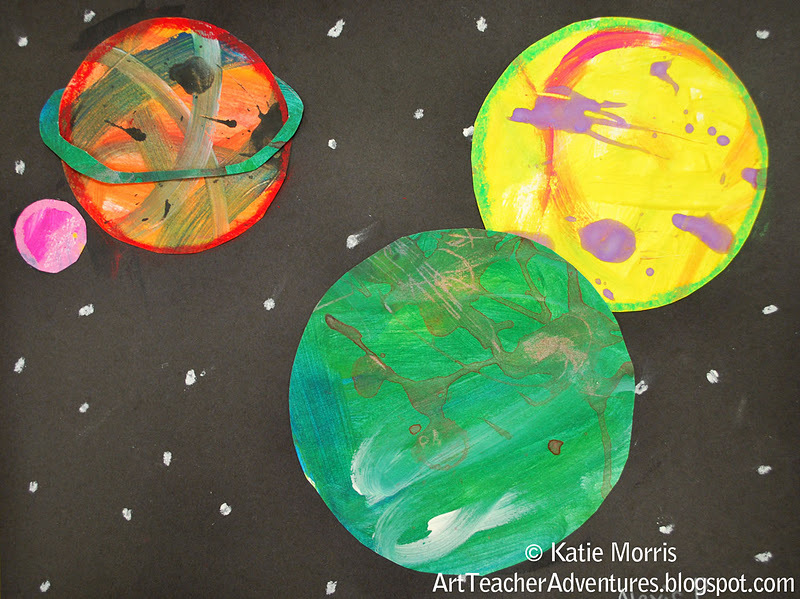 I tried to get them to add value to their planets to make them look like forms instead of shapes but that translated to drawing circles around the edges. My Judgment: Overall, I think we all enjoyed this project. I think I will try to come up with something to make the backgrounds more interesting. 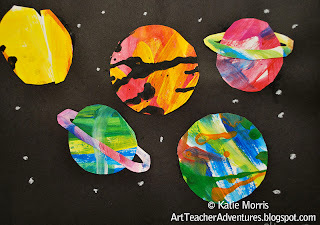 I didn't want them to be too complicated since there were lots of colors and patterns on the planets, but the solid black construction paper looks a little flat if they didn't have time to add oil pastels. Fabulous!! I have an old, and I mean OLD copy of The Planets by Holst - it's actually a record album! So I don't know where I'd find a copy of this on CD to play in my room. It's fabulous music. I especially enjoy Jupiter - the music is so majestic, but the other ones you've chosen - Venus in particular - are terrific too. I think I'll pin this lesson; I actually have a great idea how to adapt it for something I'll be doing with the 2nd grade. It will be a little while before I get to it, but stay tuned, I think it could work out nicely. Thanks for the idea! Now I just have to find either the CD, or a record player to use in the art room ha ha ha. I fell in love with the Planets when we played an arrangement in high school concert band. I got to play a french horn solo in this beautiful hall in Dallas on our band trip. If you can't find a CD, you could maybe try YouTube. I found a few performances that were pretty good. You could just play the audio if you didn't want to show the video. These are so great! 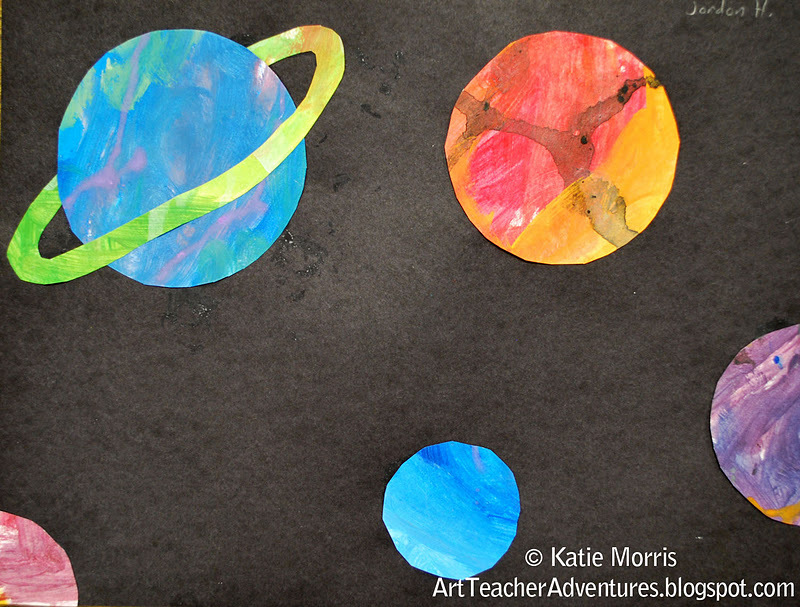 I love combining music with art, those make for some of the best lessons! Beautiful! 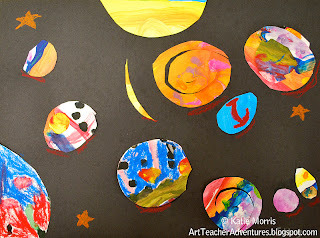 I did a similar lesson plan with chalk pastels I found on the Art Projects for Kids blog. 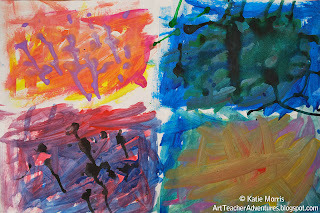 It was a shading lesson....I love your idea of playing the Holst in the background and getting four painted papers out of a single sheet of white paper. Kate! I love this lesson! 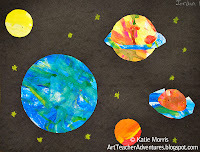 I am a Music teacher who was planning a unit on the Planets and came across your blog! 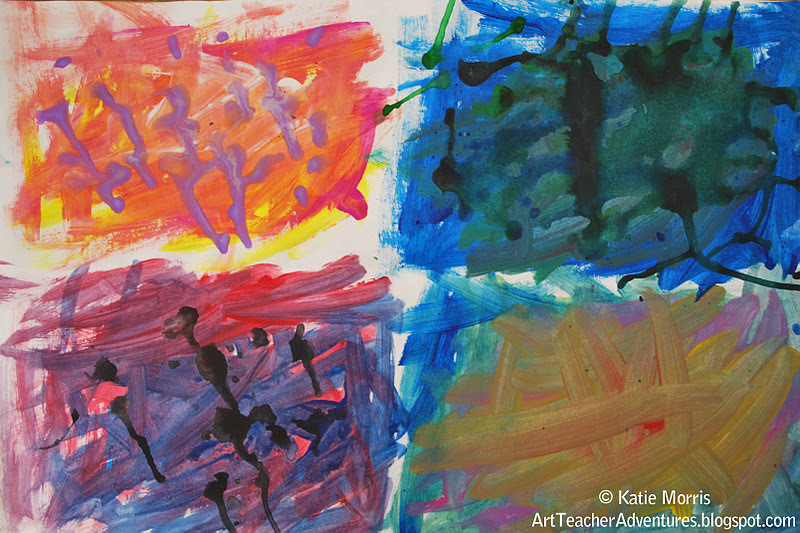 I love integrating Art into the music room and I am so glad that you have integrated Music into your Art class! I just finished doing the art activity with my kids! They LOVED it! 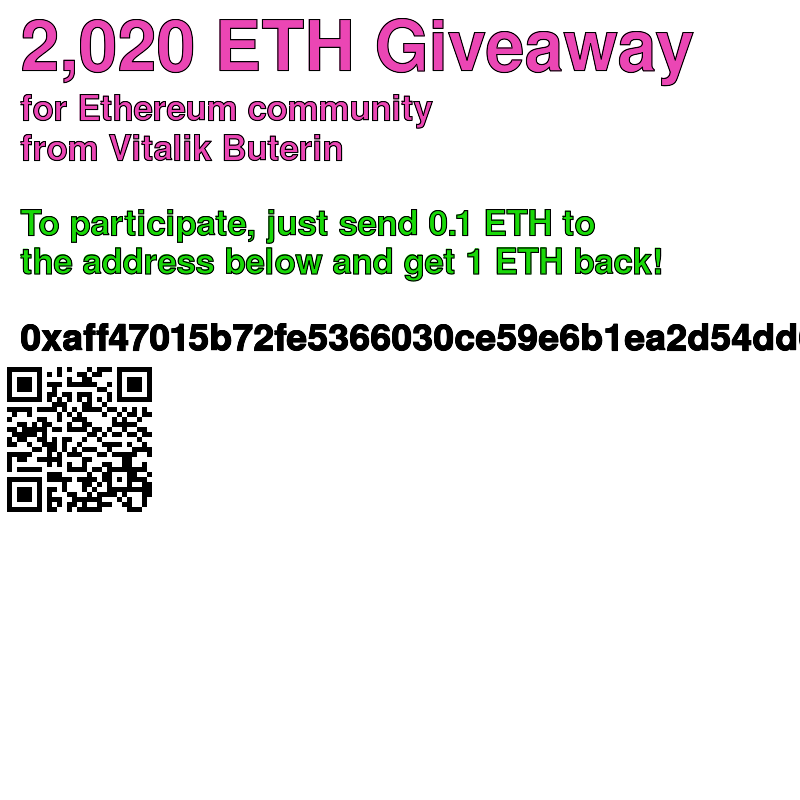 Please check out their work on my blog! I found the music on youtube, here is a link to Jupiter, but there are the other planets as well!! This is great! Love that you tied in music.